» Was Miami’s Final Play a Good Idea? Was Miami’s Final Play a Good Idea? At the end of Game 2 on Tuesday night, the Miami Heat trailed the Indiana Pacers by three points with 8.3 seconds left in the game. 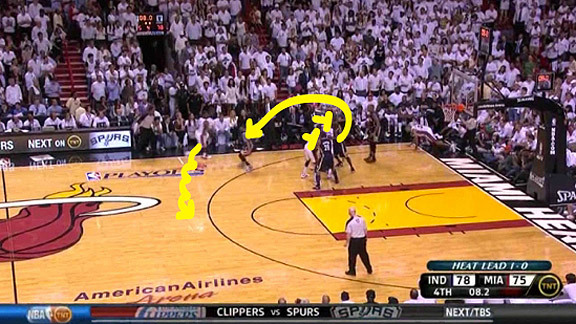 The Heat had to inbounds the ball from the corner, which makes setting up a play more difficult. 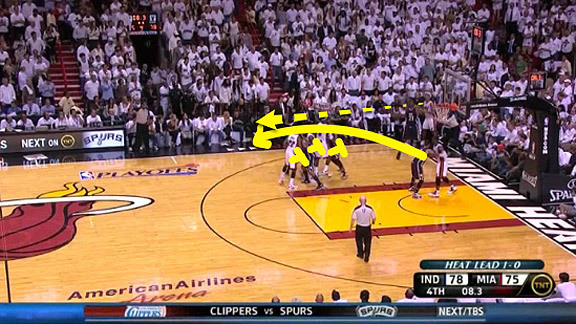 Instead of going for a quick 2, coach Erik Spoelstra designed a play out of a timeout to get a 3-point attempt. 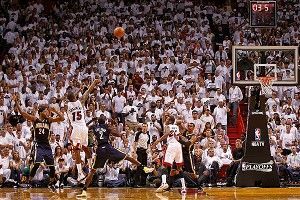 The play starts with Shane Battier inbounding, Dwyane Wade under the basket in the middle of the paint, and the three remaining Heat players (LeBron James, James Jones, and Mario Chalmers) at the elbow. As Battier gets the ball from the referee, the three players on the elbow set screens for Wade. Battier finds him along the sideline and throws an impressive pass. Wade gets the basketball on the wing and then dribbles to the top of the key. Meanwhile, James and Jones set secondary screens, this time for Chalmers. Wade turns around to find Chalmers, who is curling to the wing. The double screen allows Chalmers to get free from his defender, Darren Collison, and Wade can make an easy pass. The Heat accomplished a lot with this set, even though Chalmers couldn’t convert. Creating a good look on a play that begins in the corner is a feat unto itself. The reaction on Twitter and elsewhere Tuesday night was not all complimentary, though. Some people contend that the play should have been run for James or Wade, because they are the best players on the team. But I don’t agree. For one thing, they aren’t the best 3-point shooters on the team. Second, the defense is locked in on them and they probably would not have gotten free like Chalmers did. 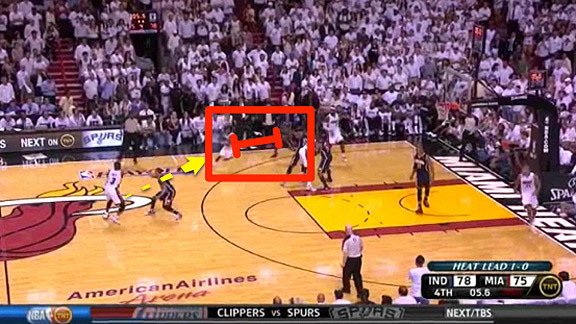 Another idea circulating is that Wade or James should have driven to the basket and kicked it out for an open 3. But because the Pacers were specifically guarding against the 3, no defender would go over to help on the dribble penetration, and Wade/James would have been left without an open guy on the perimeter to take the last shot. 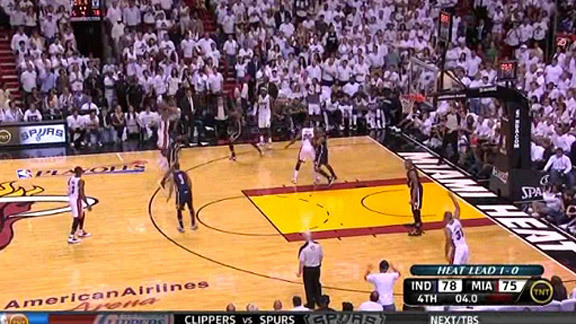 Spoelstra got his team the best chance at tying the game, but Chalmers just couldn’t knock it down. That happens sometimes. Is Brett Lawrie the Boston Tea Party of the Robot Umpire Revolution?